In making this cake, I urge you to use fresh carrots and finely grate them. Don’t use carrots that have been in the drawer for months or a bag of grated carrots… I have tested this recipe on several groups of non gluten free people who could not tell it was different (gf) and thought it was pretty tasty. This will be one of the many recipes I am posting for Easter. This would be a delicious addition to any Easter celebration, not too mention festive to the particular holiday. This recipe is easy to double for layered cakes or sheet cake. 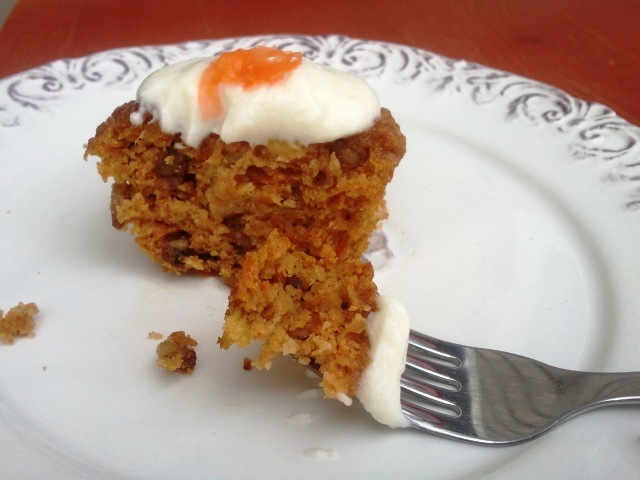 Please enjoy my gluten free and grain free carrot cake recipe! Whisk together oil, honey and eggs. Stir in carrots and pineapple. Whisk in dry ingredients, making sure you get out all the clumps. Top with my creamy vanilla yogurt frosting or your favorite cream cheese frosting. Thank you Tessa, I love to hear feedback :) Just to let you know I posted the Vanilla Yogurt Frosting today. I found your site via Elana’s Pantry…I’ve recently been “moving” to eating gluten free and am anxious to try this recipe and the brownies! They both look yummy. What elevation do you live at as I’m as 5500ft & have high altitude adjustments to account for? I’m glad you found my site! I am in Maryland and have actually not been asked for high altitude adjustments to my recipes. I am not very familiar with that, but based on what I have read, I think adding an egg to each recipe would be helpful. I checked out your blog and it seems you may have a better idea of what to change :P Please be sure to comment under each recipe what you end of trying, as I am sure others in high altitude locations could benefit. I’m sorry I don’t have a clear answer for you. thanks! while i have a handle on high alt. adjustments for wheat, i’m kinda stumbling through the no gluten world…your site is a welcome relief…will post comments when i make this…the brownies are first on the list this sunday! I made this last night…2 layers with cream cheese frosting. It was amazing! We all loved it! I even sent it in lunches for my kids today! Thank you! I made this to share at our Resurrection potluck today and it was fantastic. We have a number of gluten and grain free people, so ti was very appreicated. I’ll be making it again for sure! Thanks so much! these were so good!! I made them as cupcakes. My daughter loved them! The first batch was almost gone in a couple of days! i’m going to try this as cupcakes for my kids next time…..it’s a dangerous recipe for me to have around; i ate the leftovers for breakfast for the rest of the weekend. Where do you buy almond and coconut flour? I live near the Key Bridge and have looked for both of those flours at Giant, Mars, Trader Joe’s and Wegmans and haven’t had any luck. Thanks so much for sharing your beautiful gluten free creations and passion for healthy foods with us ~ I certainly do appreciate your efforts! Your website is amazing. I live in Singapore and am struggling to find coconut flour anywhere. The concept of gluten free products is just coming to the surface here. Is there anything I can substitute in this recipe for coconut flour and pineapple (I’m intolerant to pineapple)? Hi Mallika! Do you have access to unsweetened coconut flakes, chips, or shredded coconut? Any of those could be made into coconut flour in the food processor. Otherwise, I suggest buying it online, but I don’t know about shipping to Singapore :/…. As for as the pineapple goes, I would sub in equal parts applesauce in the recipe. Hope this helps! Thanks for these awesome recipes! This is a fantastic recipe!! I’ve made it 2 nights in a row now due to popular demand! Thank you thank you for your sharing of your fabulous recipes. It’s so nice to have something that I can eat that tastes amazing and doesn’t make me feel bad afterwards! I’m a cinnamon-aholic though, so I quadrupled the amount of cinnamon that was in the recipe. :D Tastes amazing and is soooo moist! Thanks Teri! So glad you all like it, it’s one of my families favorites too! Michelle – love your recipes. Our family just started on the gluten free journey and I have made several of you recipes. I cant wait to try this carrot cake as I LOVE carrot cake. My husband LOVES your almond curried chicken, second in two weeks that I am making it. Thanx for sharing with us!!! This looks delicious! Do you have an idea of what I could replace the pineapple with? Maybe unsweetened applesauce instead of the canned pineapple? Thank you! I made this for Easter and it was delicious! Just added some raisins. :) I love your site. It is my no#1 favorite grain free site. Your recipes are so easy to follow and I appreciate the simplicity of ingredients. Also, they are extremely child friendly! Take care. I made these as cupcakes and a small cake a year ago for my sons first birthday and they were a huge hit!!!! This year I’m making as a cake again for his 2 year old birthday! It’s so yummy i couldn’t resist! !